Raby Castle, seat of William FitzRoy, 3rd Duke of Cleveland (died 1774), was built by King Cnut (Canute II the Great) in the 11th century. During the English Civil War it was a stronghold for Sir George Vane and his Parliamentary forces. Although it was besieged in 1645 and 1648 it suffered little damage. 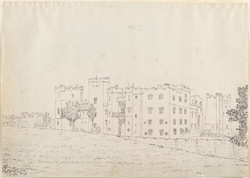 At the time of this drawing the castle was undergoing extensive restoration work, instigated by the architect James Pain.